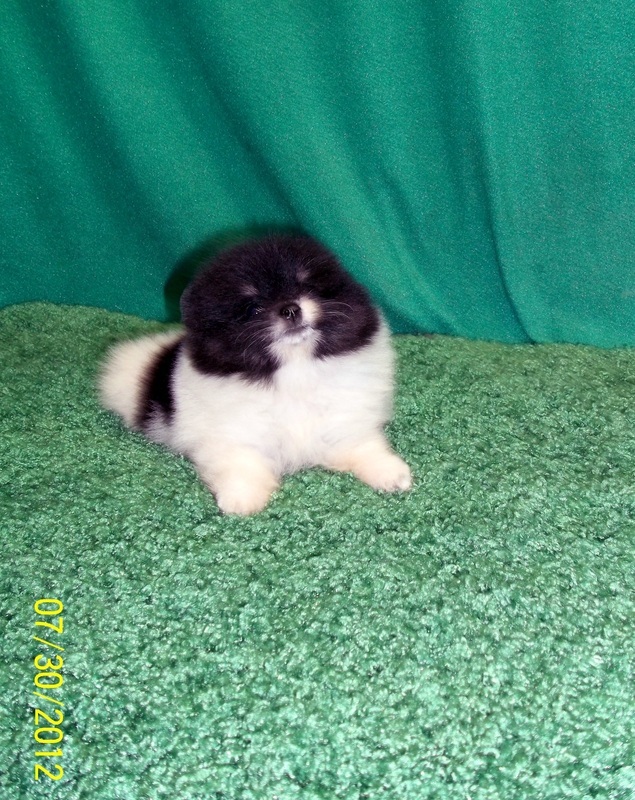 The Pomeranians for sale on this page are placed as companions unless otherwise noted. Please state whether puppy is wanted for companion, breeding or show purposes. THIS PAGE LAST UPDATED ON JUNE 7, 2017. Sky is available to a loving pet home with neuter contract. This little guy is absolutely gorgeous and should mature about 5 lbs. according to the toy breed weight chart. He is soft and sweet and cuddly as a tiny teddy bear! We are located in Alabama, USA.This puppy is well-bred and it shows! His lavender merle parti color coat is just perfect in texture and volume for his job as resident cuddle-bug! . He is going to be about 5 lbs. at maturity. Bring this adorable little doll home soon as he will be in big demand! Born to love on:8-12-2014 Current weight 2 lbs.8 oz. 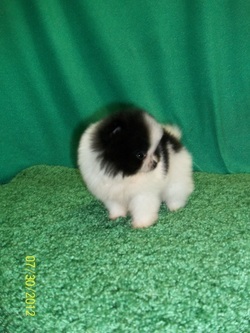 p is a show/breeding quality black parti-color charming boy with a sweet and silly personality. He is just 6 weeks old in this photo-and already he is exquisite! His coat is so huge and pretty as he is well-bred and it shows! He will be in the 4 lb. range at maturity according to the toy breed weight chart. He is potty-training for pee pad. Call soon as he will find his forever home quickly! Born cute on:6-18-2012 Current weight 1lb.1 oz. Please speak with a consultant before reserving your puppy. hat a beautiful black & tan parti girl Bella is! She is definitely a socialite girl-as she never meets a stranger. Her favorite toys are always nearby as she plays happily. She has an impeccable pedigree and if she becomes a mother will be sure to pass that on to her children. She will have full AKC registration if her owner chooses. Liven up your home with this perky Princess! Born to rule on: 6-18-2012 Current weight 1 lb. 5 oz. She is expected to weigh 5 lbs. at maturity. Shogun is a fabulous blue merle parti-color boy with a gorgeous face and a huge coat! He exemplifies what a blue merle should look like! He loves to show off for the crowd and yet cuddles contentedly when it's pillow time. Don't wait to call about this little guy-as he will go to his fur-ever home soon! Please call 419-610-6084 to speak with Cyndi about bringing SHOGUN home. AKC conformation, agility, rally, or obedience-this little guy could do it all! He is so smart and catches on to everything so quickly he could be dual-titled easily. 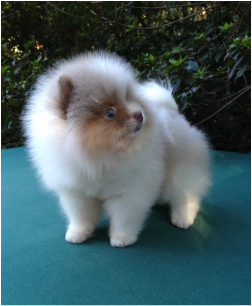 If your wish is to have the prettiest Pom in your entire area-he could do that easily as well! He is perfection in a small package. Born to show on:2/3/2012 Weight- 2lb. 2 oz. We now have a page on Facebook! 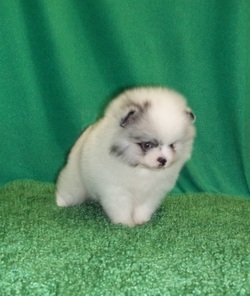 Click on Like Posh Pomeranians and friend us!